VR Therapy Center uses the EAGALA Model from EAGALA. Serving Howard County, Baltimore, Washington D.C. and Central Maryland. Thank you for visiting our website. We are passionate about helping children, adults, families and businesses find and maintain balance in their lives. We use a whole body system approach that incorporates nutrition, vitamins and exercise, the mind, and spirit. We believe it is important to integrate life meaning into sessions. As a psychotherapist and with a background as a fitness trainer, we have found the importance of a healthy body gives a healthy mind. Our Psychotherapy practice is about enabling individuals to recognize and address the obstacles that are keeping them from finding that balance. We work with children (3-10), adolescents and adults. As former educators we are able to help children and families navigate their lives in a more positive and healthy way. What makes our practice unique is that we also incorporate Equine Assisted Psychotherapy with clients, which is a discipline of using horses as a means to provide metaphoric experiences to promote emotional growth. This is an experiential modality, which means that clients learn about themselves by participating with horses, and then process behaviors, thoughts, and patterns of daily coping. This type of Equine Therapy is not riding, but involves setting up ground activities involving the horses, which in turn requires the client to apply certain skills. What clients have experienced using horses for their sessions is healing, growing and learning about themselves. Equine Assisted Psychotherapy Center has been effective with clients who manifest anxiety, depression, attention-deficit disorder, conduct disorders, dissociative disorders, posttraumatic stress, autism, and other disorders and disabilities. 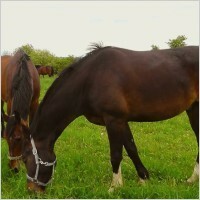 This type of horse therapy is also used for growth and learning with marriage and family therapy. By using horses, we have found a special healing, growth and learning in our clients. Equine Assisted Corporate Teambuilding Center is an innovative and experiential program offered to corporations and other businesses that wish to improve various skills in their teams. Our program uses team-building exercises with our horses and facilitators to develop leadership, communication, personal growth, corporate culture, and positive team development. We will tackle real world challenges occurring in your business, or simply focus on giving you and your team a fun and different training experience, all based on the needs of the team. This type of Equine Assisted training is not riding, but involves setting up ground activities involving the horses, which in turn requires the team to apply certain skills. We listen and adjust methods to meet your needs. We utilize a variety of techniques, including; cognitive behavioral, existential, solution focus and homework assignments as agreed upon. We utilize meditative/mindfulness approaches for awareness and relaxation. Therapy is collaboration, as ultimately the power to change rests within you. Empowering students through Equine Facilitated Learning: An interactive Experiential Approach on How Horses Can Strengthen the Way Our Students , Lead, Live, and Learn! ** Bullying ** Peer Pressure – how about horse pressure, this will be fun! 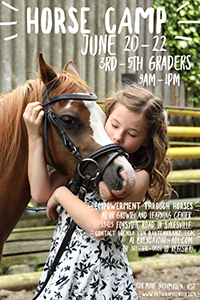 Empowering Girls through horses is a gentle and effective way of fostering self-discovery and healing through being in nature and connecting with horses. This program promotes self-awareness, communication skills, and healthy boundaries. These types of ground activities, (not riding), that influence participants to “apply certain skills,” such as confidence or social skills, with horses. We are featured in the Sept/Oct issue of Her Mind Magazine. Time to get up and moving! All ages and fitness levels! The World of Pets Expo and Educational Experience takes place on January 25, 26 & 27, 2019 at the Maryland State Fairgrounds in Timonium, MD. The World of Pets Expo is a cornerstone event for East Coast pet enthusiasts and animal lovers alike. This year will mark the 18th anniversary of the Maryland World of Pets Expo and we are expecting this year to one of the largest and most entertaining yet. This exciting three-day expo is one of Maryland’s only family and pet friendly events that is fun for all ages and is considered the Ultimate Event for the Pet Lover. Check out last year’s activities. vR Growth and Learning Center was featured in the Sep/Oct issue of Her Mind Magazine.